After the excitement of unveiling our winners, we set to work planning the library makeovers. With Passionate Readers by Pernille Ripp in mind, we considered how best to design libraries that put students at the center while also honoring teacher’s individual styles and ideas. In order to keep teacher and student voices front and center, we interviewed the winners. We crafted questions to guide our conversations with teachers and students and help us consider how best to accomplish our mission to design the libraries that increase student engagement and ownership and nurture children’s love of reading. What are you hoping for with this library makeover? What are your goals? How do you envision the space? What do you have in place now that is really working for you? What are your non- negotiables? What are you hoping for in a new classroom library? Where is your favorite place to read in the classroom? Tell me about your reading spaces here? At home? What do you love to read? Genre? Author? Series? What do you like about the school library that you would like to see in your classroom library? Overall, teacher and student ideas are very much aligned. The teachers want libraries that grow readers. Students want libraries that are cozy, inviting and easy to use. We share this sketchnote of our findings. Teachers and students privileged easy access to books and libraries that are at are easy to use. Both students and teachers are eager to explore ways to label bins. One student specifically said he did not like books organized by levels. They prefer bins labeled by series, genres, authors and topics. They wish to build their collection of series books and in one case, gave us specific titles to add. All library recipients liked the idea of displaying books. The teachers hope that doing so will entice readers to expand their reading diet. Students like the way books were displayed in the library. Although it can be difficult to let go of books, the teachers recognize the value going through their current libraries and retiring the books that no longer entice students to read. A librarian explained this best when she said, “Weeding out a library is like weeding out a garden. You don’t want to put too many plants in one spot.” Removing low interest books will provide opportunities to showcase engaging ones and hence, make the libraries easier to navigate. The teachers were very open to rethinking the physical space of the classroom. Our teacher interviews took place in the classroom where we could envision and reimagine the space together. Some teachers supported flexible seating and were open to allowing students to read anywhere in the room they wanted. Students added a request for cozy seating specifically pillows and bean bags. We want our libraries to be lively, engaging spaces where students and teachers talk about and share books. Our interviews revealed that both the teachers and students saw writing book reviews as a means of accomplishing this goal. In fact, one teacher shared innovative ways to use technology to create videos, post them in Seesaw and create QR codes that will hang in the library for easy book sharing. An opportunity presented itself to bring the school librarian into the Library makeover project. When I walked into the school library to begin student interviews, I found that the students were writing book reviews! “This is perfect,” I thought. “We can use these reviews as the content for student videos about books.” Additionally, the librarian and I set up time to work together to help students write their reviews thus creating a collaboration of teachers, librarian, and coach! The Classroom Library Makeover project is truly a journey! These interviews provided us with a solid foundation of where to start however, we look forward to the many discoveries and adjustments along the way! 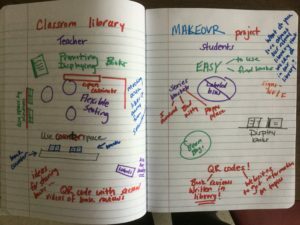 While all 5 libraries share the same goal: to grow students’ identities and engaged and joyful readers, we anticipate the path of each library to be as unique as the teacher and students who will create it. We invite you to stay tuned as we continue on our journey.